The ECOM BROADCAST EBL 9000 Audio Broadcast logger is an off the air recording systems for radio stations who broadcast program material and want to recording there programming for monitoring and archiving purpose. The Package includes external FM tuner along with recording platform. 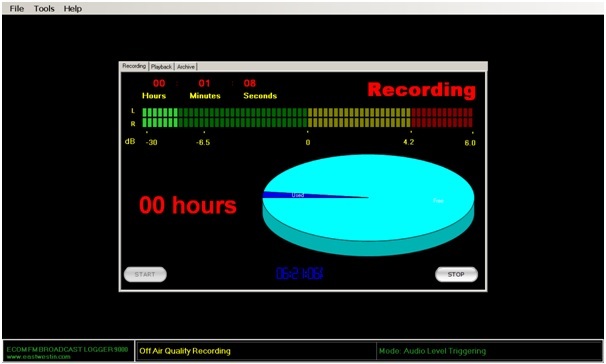 The EBL 9000 broadcast audio logger records and automatically saves files in 15min intervals to minimize loss of data in case of power failure, with adjustable audio quality options. The sound files can be recorded in WAV and MP3 format and the archived audio can be retrieved and using the inbuilt player. Allowing fast program material can be searched and listened. The recorded files over a network can be listened to more workplaces (air-checks) and the current capacity of hard drives, all broadcast programs for many months, even years, will be saved. Logger station is maintenance free. It manages the disk and delete the oldest sound files necessary to create space for new ones. How much you can save depends on the preset sound quality and size of the used hard disk. If your settings to make sure that you no longer meet the aforementioned 15 days retention compliance will drive logger you this warning.